I spent the afternoon yesterday at my friend's house, having a lovely time with her sewing machine. It's WAY up the food chain from my beloved 26 year old mechanical, and does all sorts of decorative stitches. 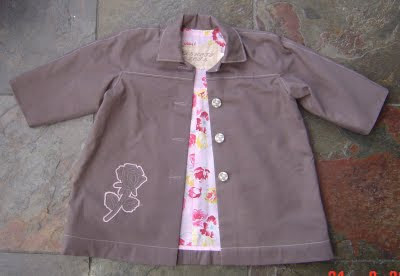 I made a bunch of labels for my designs and did keyhole buttonholes on the jacket and coat below. This one is the third version of my shirt draft. I like the collar a lot better on this one, one piece, with a cut on facing on the shirt fronts. It's a neater, cleaner look and easier and quicker to do. 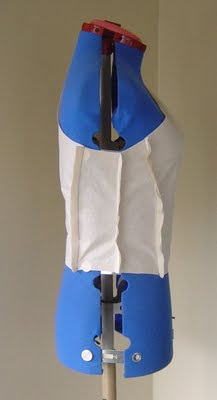 On the next version I'm going to cover the overlocking at the back neck with a strip of bias. It's not rough to touch but it doesn't look as nice as I'd like. This is the first version. (The second is cut and waiting to be sewn. It has a stand and fall collar, and I'm not sure I'm going to like it, so I skipped straight to version 3!) Version one has a collar drafted straight from Aldrich's instructions to look like a stand and fall, but cut in one piece. As I sewed it I kept thinking that I've never liked this type of collar. I finished it, but I still don't like it. It's way harder to make a one piece stand and fall sit nicely than a proper two piece or a single piece like my third version. I'm not using this collar again. 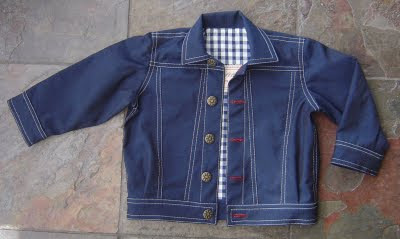 This is the finished jean jacket. I love the red keyhole buttonholes and muted finish on the buttons. The buttonholes did give us some problems, notably on the yoke where there was uneven bulk affecting the feed. My friend had the very clever idea to shim the lower side with folded fabric, which we pinned into place. Going slowly and carefully worked a treat. This coat also has keyhole buttonholes. I just love how they look! I am coveting a machine which will do them. I wonder if I could track down one of the Singer attachable buttonholers I've been envying on other people's blogs? Now on to the party dress. A friend is having a birthday with a zero in it, which naturally requires a new dress. She chose this dress from one of my Burda WOFs, without the huge shoulder ruffle and with a reduced skirt. Her measurements are very close to a Burda 42, so I cut a muslin to that size and fitted it to my dummy with the expectation that it'll need tweaking. I was interested to see where the princess seams are placed. They're a long way towards the sides, and the front ones don't go over the bust at all. I'm really keen to see how they sit on an actual body. 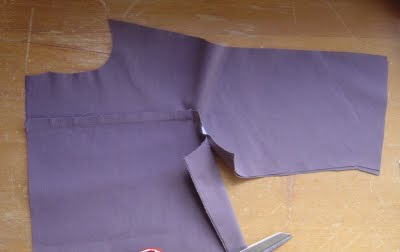 The dress itself is to be a vibrant purple colour, and I'm looking forward to making it. It may not be for me, but at least it's a proper detailed project! Underlining, actual lining, invisible zip, well stabilized neckline, hand hemming....... How geeky is it that I am salivating over the tricky bits? I am so excited! I went into Miracle today. It's a lovely baby shop here in Dunedin, (where I buy my flushable nappy liners.) I've talked to the staff there before about the possibility of selling my designs (after they commented on my red coat, hehehe), and today I took in what I've done so far. I was utterly stoked to get a very positive response, some very useful suggestions, and willingness to sell them. The staff member I spoke to said that she thought my first coat could go for about $120, and the matching pinafore for about $80! I was very pleasantly surprised to put it mildly! I'm going to finish the things that need bits and bobs done and make a couple more things and see where that takes me. This is such a fun way to use my spare (HA!) time when inpspiration for my own sewing is sadly lacking. I know these are not the most exciting pants in the world, but they are my own design, made from my own drafted block, and I'm really pleased with them. 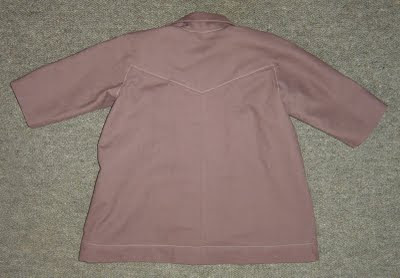 They're made from the same soft lightweight cotton as the vintage inspired coat, so I self-lined them. 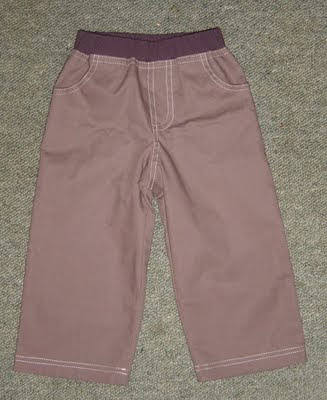 The waistband is a knit to reduce bulk and make them more comfy to wear. And the back. 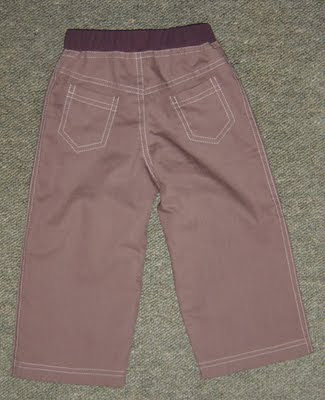 Very basic jean design lines, but there's no shaping in any of the seams so they're a piece of cake to make and line. If I don't ever get around to selling these I'm looking forward to putting them on Nicholas. When I started this blog I intended to chronicle my more interesting sewing projects, but apart from my red coat it's been mostly basics and kid's sewing. And I have got a huge amount of satisfaction and enjoyment from my drafting and designing, as well as clothing my children. BUT since I've been keeping track of it all I've realised that I really really really want another complicated challenging project for myself. I'm going to go through all my patterns and all my fabric stash and if I don't find a suitable project I'm going to break my self-imposed Must-Use-Stash-Instead-Of-Buying-More-Fabric rule. Enough is enough. It's MY TURN! 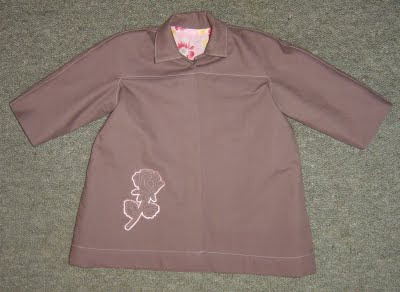 I seem to have a bunch of garments which are all done but for buttons, an extra row of topstitching, that sort of thing. Here's another. My take on the vintage pattern just needs buttons. I have to take my eldest to the orthodontist tomorrow, so I'll go and get buttons while he's there. Here's the front. It doesn't actually wrinkle at the armhole the way it does here. It's very hard to photograph garments flat, but I'm scared to put it on Isabella to model in case she dribbles or spills on it! And the back. I didn't put the inverted pleat in from the original, but I may in a future incarnation. I just added flare to the sides, and a little at the CB. I chose a nice bright floral cotton for the lining. I like fun linings - bright and cheerful. To finish the hem I used bias binding which I pulled tight as I applied it to ease in the lower edge. Worked a treat and gives a very nice finish on the inside. As much as I WANT to sew something for MEMEME, I'm stuck with not really having suitable fabrics in my stash (I have a lot of I-won't-find-this-again-on-sale type fabrics - mostly far too dressy for what I actually need), and since I'm still breastfeeding and loving my nursing tops I'm not bothering to make any other style just yet. So instead I've been working on my own designs and drafts. I saw this totally adorable vintage coat pattern on Thornberry's blog, and just HAD to interpret it myself. Winifred Aldrich's drafting for childrenswear book had exactly that yoke detail covered, so it was a snap to draft. Sewing had to wait till today when I was able to get to Spotlight for thread. The fabric is a lightweight cotton, so I doubled it. Normally I'd have hand basted the layers together as for underlining (which it is), but I figured that with such small pieces I could control them well enough, which has proved to be the case. 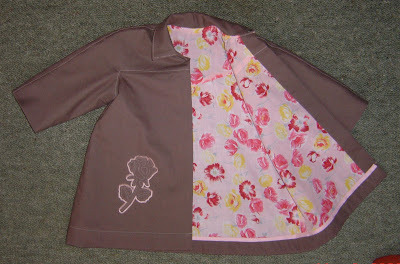 Firstly I fused scraps of interfacing to the inset corner seams and drew on the stitching line. 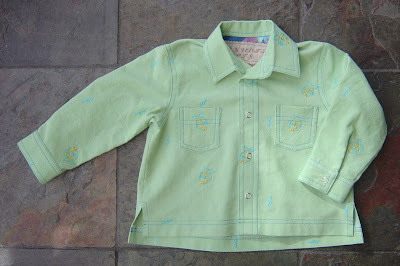 Then I stitched immediately inside the drawn line and clipped to the stitching. 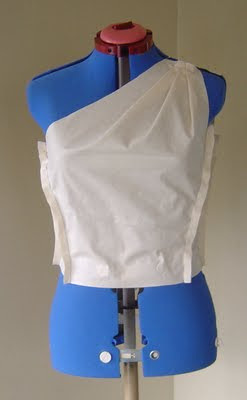 Next I sewed each seam to within a few centimetres of the underarm. After sewing fronts and back in this manner I sewed the side seams and the underarm seams on the sleeves, then finally the lower armhole seam. 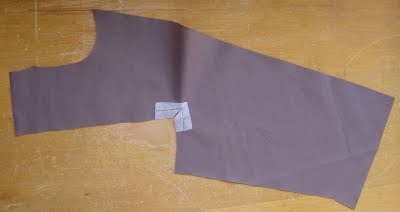 I think that garments like this sit better when the sleeve is set in rather than sewn as though flat. After topstitching this entire yoke seam and sewing one shoulder to hem sleeve seam I realised that I hadn't applied the rose applique/embroidery I'd intended to put on the front. DOH! So now I'm doing that. It's the same one I did on this coat. I, um, kind of like roses. 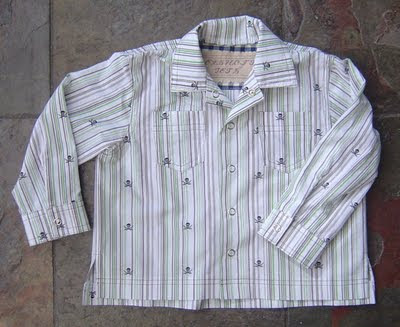 Now that I have the threads I needed, I can make progress on several other garments in production. I almost hope I don't sell them because I want them for the twins! Karen, the cover I'm making for Dad's boat is tent-type canvas. He got it from a manufacturer locally. We copied the style of a cover on another boat, and while the style and measurements were set before we started, a lot was worked out as we went. It has a clear plastic zip up door, and is intended to be a roof when they sleep on the boat. I'll post some pics next time he comes over to work on it. It's a very big job, and requires the two of us to sew - my machine handles the canvas just fine, but I need Dad to take the weight of it because it's too heavy for my machine to drag off the floor! Monday I had all the girls over and one of them dropped off fabric for V1061 because she'd seen mine and wanted one too. I owed her sewing in return for looking after my kids during school holidays from before I had the twins, so I was very happy to make it for her. Tuesday the friend for whom I was making V1061 came to visit while I worked on it so I could check the bust point before cutting. Another friend came over to look through my BWOFs to find a dress pattern to wear for her upcoming 60th birthday. She found a few possibilities! Wednesday my father came over with his boat so that we could work on the cover I'm making for it. We got the last of the fitting and shaping worked out, which means that now it just needs finishing. Still a lot of work, but at least Dad doesn't have to tow his boat across town for fittings! Thursday the V1061 friend came over to visit while I sewed. She's a beginner sewer. We're working on that. Friday the BWOF friend popped in to drop off the magazines she'd borrowed and some calico, and the V1061 friend dropped in to visit and have a fitting. The bust dart I'd carefully repositioned after tissue fitting dropped with her lovely drapey rayon knit fabric and had to be put back where it started out. I hadn't overlocked it, so no drama. I love company while I sew! Saturday she came over to pick it up and get her jeans hemmed. After that I sat at my desk and thought "What do I feel like sewing now?" and instead of working on baby designs, or heaven forbid, something for ME I whipped up another Jalie 2682 for Georgia. I can't link to it at the moment because the site is down while they upgrade it, and I can't photograph it because she wore it to school. Sunday V1061 friend texted to say that she was wearing the top to a church concert and had had lots of lovely comments on it. Made her feel a lot less frumpy and dowdy. Yay! I so need to make something for myself.